Trump (a/k/a T-Rex) has set in motion the destruction of his prized real estate jewel, Mar-a-Lago, in Palm Beach, Florida. The good news for T-Rex is that he will be dead when the destruction occurs, unless Steve Bannon actually possesses evil powers and somehow keeps T-Rex alive, forever. The bad news is that his kids and grandkids will pay the price. T-Rex has axed a whole range of Obama environmental-protection regulation and efforts, and he has declared that the US is withdrawing from the Paris Accord. One axe has fallen on an executive order that Obama issued that required federal agencies to account for sea-level rise and extreme weather events when making grants and plans for building any infrastructure. The rationale is simple enough. Why build infrastructure, like bridges and coastal defense systems, for the future unless you build something that will survive changing climate conditions, like sea level rise and extreme weather events. If you don’t account for such developments, the money spent will be wasted, as will the lives of those who will depend on the protections allegedly offered by such infrastructure. Another axe is about to fall, and will add to the injuries from the first axe. The future conditions, that will likely occur and have to be accounted for, are assessed in the US Climate Science Special Report. The report is currently pending before various federal agencies and the T-Rex White House (or more appropriately, the Dark House). This Report, and its possible future application, is discussed in some detail in the Reports section of the current issue of irish environment. The report assesses the current and future impacts from the human-induced climate change that is rapidly unfolding. In a worse case scenario, it is expected that global mean sea level (GMSL) could rise as high as 8 feet (2.4 m) by 2100. In another recent study, the National Oceanic and Atmospheric Administration (NOAA) has projected a worse case of a 10-12-foot rise in sea level by 2100. The probability of such extreme rises may be difficult to estimate, but it is disturbing that it can happen, as a result of the unfolding impacts from climate change. 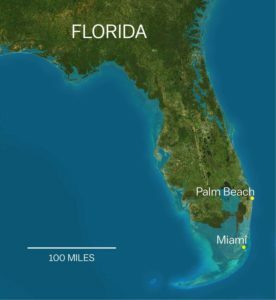 Florida will be most vulnerable to such sea level rises. 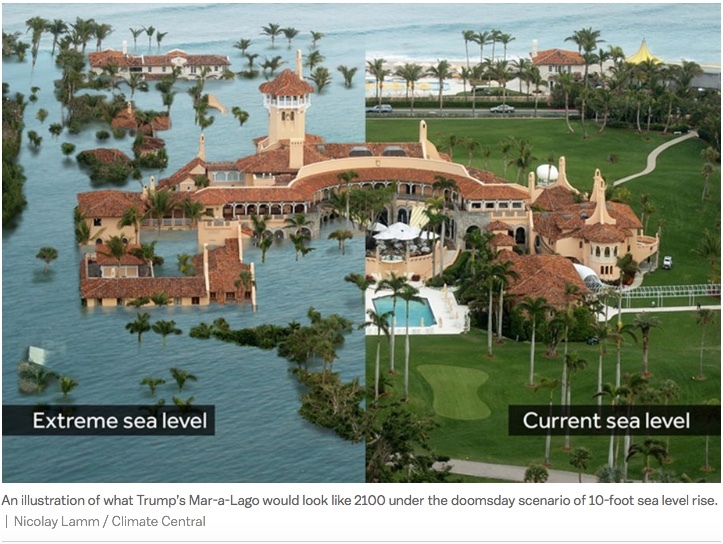 If there is no planning that accounts for the sea level rise, and if the T- Rex administration ignores or undermines the pending Climate Science Special Report, then here is what Mar-a-Lago would look like in 2100, assuming a 10-foot rise. A fitting watery grave for T-Rex’s real estate jewel. Unfortunately, all his neighbors will suffer as well.